This is another really strong jobs report with non-farm payrolls rising 304,000 in January. This was above even the most optimistic forecast in the Bloomberg survey and suggests that the US economy is in great shape with businesses desperate for workers. 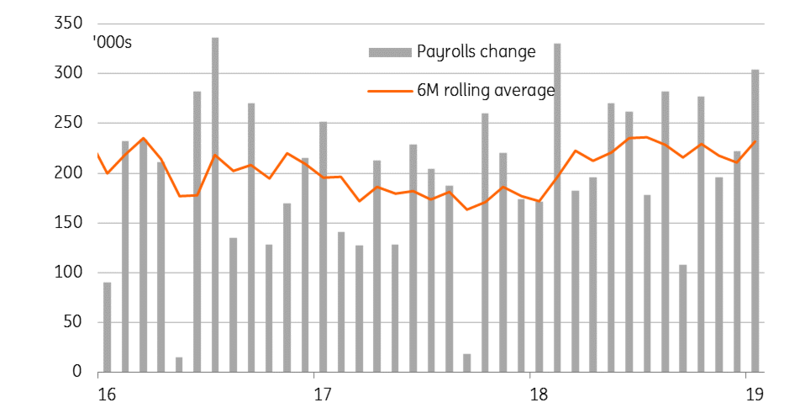 Admittedly some of this strength stems from a 90,000 downward revision to December 2018’s initially reported payrolls figure, but it suggests that the US economy hasn’t been adversly impacted by the government shutdown in any meaningful way. Pay was a little disappointing, rising just 0.1% month-on-month – the weakest growth rate since February last year and below the 0.3% consensus – which seems odd given the fact other surveys suggest businesses are struggling to hire workers and pay is going up, Indeed the National Federation of Independent Businesses earlier reported that over a third of small businesses have vacancies that they cannot fill, with plans to raise worker compensation at all-time highs. Furthermore, the January Beige Book published by the Federal Reserve reported that “wages grew throughout the country… across skill levels, and numerous Districts highlighted rising entry-level wages as firms sought to attract and retain workers and as new minimum wage laws came into effect”. The annual rate of wage growth is still 3.2% year-on-year, in line with expectations, and if we get a 0.3% MoM reading next month, annual wage growth could hit 3.5%. Wage growth for production and non-supervisory workers is already there. This acceleration in wages is apparently attracting workers who had left the labour force back into the market. The worker participation rate rose to 63.2%, which is the highest reading since August 2013. As such, the fact that the unemployment rate rose to 4% shouldn’t be too much of a concern. Firms clearly need workers and this increase in labour supply will be absorbed as long as they have the right skills. Job creation will likely slow in 2019, but this is as much due to a lack of suitable workers and firms not able to fill vacancies (despite rising labour supply) as it is to economic headwinds for the US. With worker pay on the rise and employees feeling secure in their jobs, consumer spending will likely remain firm while adding to inflation pressures in the economy. Fed Chair Jerome Powell talked of economic and market crosscurrents, justifying a pause from the Federal Reserve, but if we can get better news on US-China trade relations, that will lift some of the global gloom. We continue to believe that strong fundamentals should be enough to convince the Federal Reserve to raise interest rates once more in the summer.